Somehow that seems to be the appropriate response. The dust data previously presented suggests that desertification increases and albedo decreases exponentially over ~40Kyrs up to the LGM. Is anyone aware of geologic evidence of a 75Kyr period where most of the ice sheet is frozen static to the crust? Is there any speculation why the maximum calculated post LGM sea level peaks out ~10 meters below the current level. It seems to me that without better simulation of the effects of ocean circulation changes, it is impossible to know what is really driving the system. DeWitt and Howard, this is an historical post that doesn’t say much about the present science. Howard, an awful lot of work has been done on the issues you identified. Thanks for the post, SoD. ICYMI, this new paper seems like something you’ll want to cover in this series. Also, where a paper is paywalled as with the 2013 one but where a public copy is available, please link to the latter so people can better follow along. While it’s certainly the case for the 2007 paper that “small changes in the parameters cause huge changes in the final results,” we should bear in mind that in the real world small changes in some of the parameterized factors led to head-long collapses. Re the ice sheet models in general, it’s become pretty obvious from multiple studies published in the last year or so that they fall vastly (IMO) short of real-world ice sheet response. That renders questionable the use of ice sheet model results to establish an upper limit on current ice sheet response rates, but is it necessarily relevant for paleo time scales? Possibly 200 v. 180 is a CO2e adjustment? Thanks for the papers, Steve. Based on the CO2e Wiki page, I get 203ppmv CO2e @(180/365)*412, so I’m sure you are right. The extra 3ppmv is probably because the CH4 fraction is lower at the LGM absent anthro sources. There is a helpful online overview of PMIP by S Joussaume and KE Taylor. I can’t access the citation by Abe-Ouchi: Joussaume, S. and Taylor, K.: Status of the paleoclimate model- ing intercomparison project (PMIP), in: WCRP-2, First Interna- tional AMIP Scientific Conference, 15–19 May 1995, Monterey, CA. Proceedings, Geneva, World Meteorological Organisation. World Climate Research Programme, 415–430, 1995 so I used that online (and later) overview. As a side note it’s an interesting, short non-technical read, especially for people not familiar with many of the dilemmas faced by modeling people. Why did we set these conditions like this? Why didn’t we do that? What objectives did we have? What do the comparisons tell us? What is the value of any results? There’s no mention of equivalent forcing. And the pre-industrial and current values match up. If it was equivalent forcing the current value would shoot quite higher due to the CH4 increases I think. 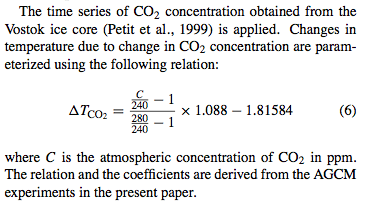 The CO2 concentration was prescribed at its pre-industrial value of 280 ppm (Raynaud, et al., 1993). And looking up that reference: The ice record of greenhouse gases, Raynaud et al, Science (1993), it seems that the Vostok record has 190-200ppm and that was the accepted value at the time. 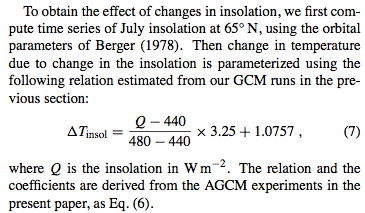 So probably Abe-Ouchi et al 2007 has selected a value of CO2 at the LGM that allows for better intercomparison results with other studies. Another dilemma for modeling people.. This could also be a possible cause of the polar oscillation effect, since expanding ice sheets over Antarctica (with precession) will reduce global sea levels and close the Bering Straights in the Arctic. This then leads to delayed cooling in the Arctic. What breaks the cycle ? I(We) propose that this is due to a strong increase in regular Tidal flushing of the Arctic coincident with the Milankovitch 100,000y eccentricity cycle. The reason for this increase in lunar tidal forces is because the moon is subject to the same solar system gravitational re-alignments that perturb the earth’s orbit. This must also change the eccentricity of the moon’s orbit around the earth because the bodies have different mass. The net result of increased ellipticity is that the distance of closest approach of the moon to the earth decreases and tidal forces increase rapidly as 1/R^3. I see two problems with this hypothesis. First, I can’t find any data on how the lunar orbit’s eccentricity varies with the Earth’s orbit eccentricity over the 100,000 year eccentricity cycle. Second, with sea level more than 100m below the current level and the edge of the North American continental ice cap at the LGM being far from the ocean, I don’t see a role for tides. It’s distinctly possible that the lunar orbit is chaotic enough that it isn’t possible to calculate precisely over that time period. We know that it is chaotic or the rotation period of the Moon wouldn’t be phase locked to it’s orbital period. There does appear to be evidence from the laser ranging experiments that there is residual variation in the eccentricity that can’t be explained by current orbital models. You are correct that there is no data on the variation of the effective lunar orbit eccentricity around the earth. The seminal work on solar system dynamics has been done over decades by the French group at Observatoire de Paris. – Lasker et al. They quote huge errors on the moon’s orbital parameters for 1 million years ago. However we can still do some simple estimates. The earth-moon are really a binary planet system in orbit round the sun. When the eccentricity of the moon’s orbit round the earth is modified by tidal forces of the sun on the moon and reach a maximum at the earth’s perihelion when the orbital axes are aligned. Currently the minimum distance between earth and moon centres is 360495km. At the LGM the earth/moon’s eccentricity around the sun was increased to 0.02 so the perihelion distance of the earth/moon system was reduced leading to 20% larger solar tides. These tides acting on the moon’s orbit therefore increase the maximum lunar eccentricity and reduce the shortest distance of approach to the earth by 5%. Combing both the larger maximum lunar tide with the larger solar tide then we can estimate how large perihelion spring tides were 20,000 years ago. This shows that spring tides were then 30% greater than today. 800,000 years ago there was a switch from 41,000 year cycle of glaciations to a 100,000 year cycle with interglacials coincident with maximum eccentricity. This seems to have happened because a gradual overall cooling trend exceeded a threshold for the the maximum inclination to melt back the increasingly larger northern ice sheets. Something else was needed to trigger the collapse of ice sheets by enhanced summer insolation. Second, with sea level more than 100m below the current level and the edge of the North American continental ice cap at the LGM being far from the ocean, I don’t see a role for tides. During the LGM most of the Arctic was covered in sea ice as well. The Bering straights were closed and the only influx of warmer water would have been through a narrow deep passage connected to the North Atlantic. There is physical evidence from the sea bed that the ice was grounded at depths up to 1000m. So the arctic was essentially isolated from heat transport from warmer souther oceans. I am suggesting that “Milankovitch” enhanced tides helped flush water under the arctic ice sheets to aid the melt back of the arctic ice. 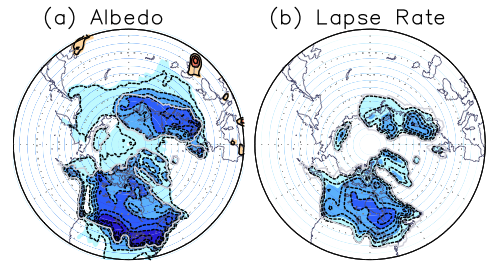 Once warmer water began to enter in the arctic summer, then the melt back could finally overcome the threshold needed for insolation and albedo feedback alone to trigger an interglacial. This also explains the sawtooth shape. In addition tides also act on glaciers and help to calving the ice. In addition maximum tractional forces occur at the poles. So I am proposing that “Milankovitch” tides may be the feather which finally breaks the camels back ! These tides acting on the moon’s orbit therefore increase the maximum lunar eccentricity and reduce the shortest distance of approach to the earth by 5%. Sorry, that’s still an assertion with no evidence. It may be probable, but that’s all I’ll give you. As far as melting sea ice, it’s the wind driven currents near the surface, not at depth, that cause melting. Once the water flowing up from the south cools, it sinks to the bottom because the salinity is higher and has little interaction with the layers above. See here, for example. It is more than just an assertion because I scale up the observed changes in lunar eccentricity every 206 days as the semi major-axis aligns with the sun. This change to eccentricity is known to be caused by changing solar tidal forces. The real assertion is that such “Milankovitch” super tides are the trigger for the break-up of the northern ice-sheets. I agree this is rather speculative but it does at least have the advantage of explaining the 100,000 year mystery ! The rise and fall of the tides generate currents or tidal streams that can be very strong, such as the rushing current between Barents and Edge Islands. When these tidal streams encounter the continental slope to the north of the Eurasian landmass, they set up a swirling current that can generate a vortex that reaches down to the seabed. I agree that the statement melting “under the ice” is wrong. Perhaps be a better statement tides cause ‘lifting & shifting’ of the ice. A comment on WUWT from a guy in Alaska actually reported hearing the ice creak and groan during tidal flows. Marshall and Clark link may be down. Great post. Thanks – I found a replacement link and updated the article. It’s a very good paper. This series was great and I learned a lot. Has anyone looked at the contribution of the Tibetan Plateau? That’s a rather large area at low latitude that was covered with ice during the last ice age. 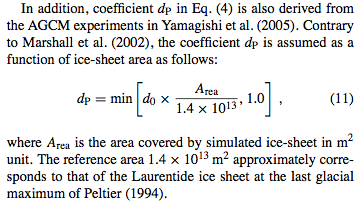 The albedo effect at the latitude of the Tibetan Plateau is about 4x the effect at high latitudes for the same area. According to Wikipedia, the isostatic rebound since the last glacial termination has been about 650m. Absent anthropogenic CO2 and LULC changes, would it have already been ice covered instead of having shrinking glaciers? I think it will only be a wild guess. But I would guess that it would not be a new ice cover. Glaciers around the world melted for 250 years before the clear increase of CO2. So it has been a “natural” process Who knows when this natural melting stopped? Has it stopped? LULCC started when agriculture was invented about 8,000 years ago. The CO2 and methane from ice core data stopped decaying about then. Ruddimann’s hypothesis is that’s what stopped the normal temperature decay back to glacial conditions that happened in most of the recent glacial-interglacial-glacial transitions. Thank you for the link. Let`s take Ruddimann with a grain of salt. Farmers changed climate 8000 years ago by increasing CO2, and monsoons cooled it down by reducing CO2 in Tibet. I think you should have a very stable level of CO2 to let such small changes have so great impact. I don`t think the CO2 budget and variation would allow that. Just a layman opinion. LIA had an increase in glaciation, and probably some reduction of OHC. This was not in balance with sun radiation and atmospheric components, so glaciers began to melt at the end if LIA. Was it the Tibet platou that washed out CO2 at the end of the Medival Warm Period? And the farmers who brought it back? Sure. Lots of people don’t accept Ruddimann’s hypothesis. It’s not exactly what you call the consensus view. The ~10ppmv drop in Law Dome CO2 from about 1600 to 1800 can probably be explained as take up and release from the ocean as a function of solubility with temperature and probably doesn’t have much to do with either farmers or Tibet. The monsoons on relatively unweathered rock represents a fairly steady sink for CO2, if you believe Raymo and Ruddiman, since the uplift of the Tibetan plateau. You get spikes in CO2 at glacial terminations that would then be drawn down slowly. But that isn’t what’s happening now. The Vostok ice core data shows CO2 increasing from a minimum of 182ppmv at ~18,0000 yr BP (gas age), increasing to 264ppmv 11,000 yr BP, declining to a minimum of 255ppmv at 7,000 yr BP and then increasing to what we consider the pre-industrial level of 285ppmv at 2,000 yr BP. Something caused that. The main argument against Ruddimann is that his hypothesis isn’t necessary. Ruddimann begs to differ and Ockham’s Razor isn’t probative one way or the other. The fluctuation of CO2 in Antarctica from 1600-1800, though, is pretty strong evidence, IMO, that the Little Ice Age was a global phenomenon and not limited to a small area in the Northern Hemisphere as some would have it. on September 8, 2018 at 3:22 pm | Reply Beyond Milankovitch | Climate Etc.